Hank Hanegraaff's recent conversion to the Eastern Orthodox Church brings up questions which Dr. Craig seeks to answer. KEVIN HARRIS: Maybe you've heard The Bible Answer Man broadcast? 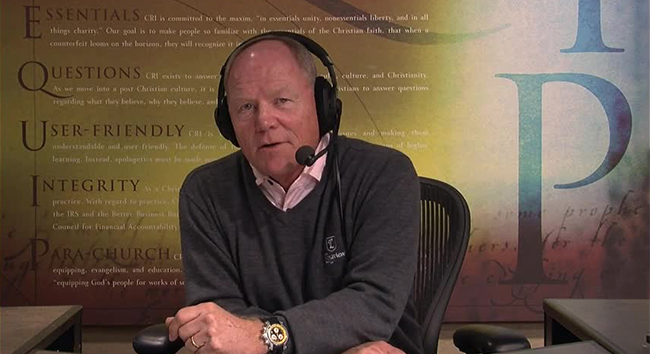 It is a radio show featuring Hank Hanegraaff. He has been hosting that show for a long time. He is the president of Christian Research Institute, a great apologetics organization. What does it mean that recently he converted to Greek Orthodoxy? Today we are going to talk about it on Reasonable Faith with Dr. William Lane Craig. I’m Kevin Harris. As we get started I do want to mention that we need to pray for Hank Hanegraaff. He recently revealed that we was diagnosed with mantle cell lymphoma, a rare but treatable form of cancer that requires an aggressive chemotherapy. So keep Hank in your prayers. Thanks for listening today. Check out our website ReasonableFaith.org. By the way, a lot of you have told us that you like the music on the podcast, so we provided links so you can download those songs. Find out more about them when you go to ReasonableFaith.org. Bill, the Bible Answer Man broadcast. You’ve been on that show a few times. From the Christian Research Institute. Affiliated stations all across the country. Hank Hanegraaff recently converted to Orthodoxy. One of the reasons we want to bring this up on the podcast – well, two reasons. One is that social media put this rumor out that he had deconverted from Christianity. We are clearing that up. Two, some of our listeners may not know anything about Eastern Orthodoxy, so perhaps we can spell some of that out. One thing that we need to be careful of is whenever we see something on social media or something on Facebook or whatever, be sure and check it out and see what is going on. KEVIN HARRIS: A few weeks ago, “67-year-old Hank Hanegraaff and his wife entered into Orthodox Christianity . . . in Charlotte, North Carolina. The former Protestant is well known among evangelicals as the Bible Answer Man. Since 1989 . . .” If you’ve listened to that show, people call in and ask Bible questions. It is a good apologetics program. Why do you think that evangelicals may make a move to Orthodoxy? I hear about this happening from time to time. DR. CRAIG: It does seem that these ancient ecclesiastical and more liturgical traditions do have a real appeal to many contemporary evangelicals who are dissatisfied with what they perceive to be the triviality and emptiness and superficiality of evangelical worship services. That certainly is understandable. When you look at contemporary worship it does seem very superficial many times. I can understand why someone would have a yearning for something more, something deeper. I, myself, don’t feel the tug toward these more liturgical expressions of worship the way many do. But there are quite a number of people who have converted to Roman Catholicism from evangelicalism. I think, for example, of Eleonore Stump or Rob Koons – very prominent Christian philosophers who were once Protestants and they’ve followed someone like a Peter Kreeft in leaving Protestant evangelicalism and becoming Roman Catholic. On the other hand, Orthodoxy provides an alternative for those who want to belong to an ancient ecclesiastical tradition but not in submission to the Bishop of Rome – the Pope. These Orthodox churches preserve the ancient patriarchal structure of the church which included the Bishop of Rome but also bishops in Alexandria and Jerusalem and Antioch and Constantinople. These Orthodox churches would not agree with the primacy of the Bishop of Rome, or the Roman pontiff that Roman Catholics hold to. So this gives them an opportunity to have a more ancient, ecclesiastical, and liturgical tradition that isn’t Roman Catholic. One should also mention Coptic Christianity as well in Egypt which is among the most ancient traditions of Christianity. Eastern Orthodoxy separated officially from Roman Catholicism in 1054.That was when the rift between the East and the Latin-speaking West was finally, decisively accomplished. Five hundred years later, of course, came the Protestant Reformation which we Protestants are commemorating this year – the five hundredth anniversary of the Protestant Reformation. But earlier than that you had Orthodoxy separating off from Roman Catholicism. And even earlier than that, within the first five centuries, you had the Coptic Church in Egypt separating off from the Roman Catholic tradition. So Orthodoxy has a certain appeal to persons who enjoy this liturgical style of worship and also (we might talk more about this) the more mystical tradition that Orthodoxy affords. KEVIN HARRIS: Do we as evangelicals and Protestants often lose maybe a sense of mystery or some of the liturgical benefits? Be a little too casual? DR. CRAIG: I think that is undeniable. Yes, very casual. Some worship services are just scandalous. There was a Roman Catholic young woman who used to come to Defenders class and she characterized the worship services here as “a concert followed by a lecture.” She missed the celebration of the Eucharist and the other elements of the liturgy. So I think that that is definitely true that in many cases we have lost a deep sense of reverence and awe that can go with meaningful Christian worship. But I, at least, don’t find that to be had in more liturgical forms of worship. There is always Anglicanism that would still provide a Reformation alternative to these other Christian confessions. I think what is important to emphasize is our ministry, Reasonable Faith, is a ministry in defense of what C. S. Lewis called “mere Christianity” which is the Christian essentials that belonged to all of these great faith traditions whether Coptic, Eastern Orthodox, Roman Catholic, or Protestant. Therefore I am so pleased when I travel to meet people from, for example, the Coptic Church or from Orthodox churches who will approach me after the talk saying how much they have benefited in their local congregation from Reasonable Faith materials in the defense of the Christian faith. We have folks who are in all of these different traditions and are benefiting from the kinds of materials that we produce. DR. CRAIG: That is very significant. He says his views have not changed. He says that there isn’t anything different that he believes intellectually than what he believed before. Now, that puzzles me a bit because I think there are doctrinal differences between Orthodoxy and Protestantism and Roman Catholicism. For example, the Pope – how you view him. How you view the patriarchate. But he says at least that this doesn’t represent any sort of an intellectual change or doctrinal change on his part. DR. CRAIG: Can you imagine that? That must have shaken him very deeply if this man of all people wondered if he was even a Christian. So he must have seen something in these Chinese house churches that shook him very deeply and made him wonder about his own Christian experience which had apparently become sterile and intellectual rather than vibrant and living. KEVIN HARRIS: We all go through seasons of our life where we need more of something than another, or we’ve been doing something the same way for such a long time that maybe we need a little shift or a change. DR. CRAIG: Here is what he says in this interview that you quoted. So there was something about worship in this Orthodox Church that seemed to pour fresh water upon the dry and arid ground of Hank Hanegraaff’s soul. It had become intellectualized and not experiential. He has apparently experienced a sort of revitalization of his Christian life through worship in this Orthodox community. It is interesting because one of the things that characterizes Eastern Orthodoxy is its more mystical approach to Christianity. In Roman Catholicism you have very carefully delineated doctrinal statements and catechesis. In certain Protestant denominations, too, doctrinal development is very fine. But in Orthodoxy, one’s connection with God is more mystical and arational. For that reason there is greater use of icons, for example, in the Eastern Orthodox Church where as Protestants have shunned the use of images and Catholics would not advocate the use of icons either. DR. CRAIG: Icons are these highly stylized depictions of either the Trinity or the Mother and Child. You have probably seen pictures of these. They often have a kind of pale greenish flesh tone hue, very flat non-three-dimensional look to them. They are very odd sorts of paintings, if you will. For the Orthodox these are not just images or paintings. These are like portals to the supernatural. Through these icons you can gain access to the realm of the supernatural and the mystical. This is not a kind of rational access. It is a more mystical communion with God. I wonder – it doesn’t say in these articles – has Hank Hanegraaff adopted the use of icons in his worship? Has he gone the full ten yards in Orthodoxy and is using icons? I think that would represent an intellectual change, I should think, in his beliefs since the use of icons is something that isn’t characteristic of Protestantism and certain not evangelicalism. The emphasis on mysticism in the Orthodox tradition was brought home to me very powerfully through a conversation several years ago with a Russian Orthodox geophysicist when I was in St. Petersburg. This was shortly after the fall of the Iron Curtain. There was a tremendous turning to God in Russia, which meant for them a return to the Russian Orthodox Church. This Russian Orthodox scientist explained to me how much closer he, as an Orthodox Christian, felt to evangelicals than he did to Roman Catholics because of the evangelical emphasis upon the Holy Spirit and being filled with the Holy Spirit. The charismatic dimension of Christianity was something that appealed to him as an Orthodox believer because it was more akin to mystical experience. He explained this to me by saying that in Roman Catholic theology the Holy Spirit is conceived to proceed from the Father and the Son. The Son is the second person of the Trinity – the Logos of God. The Spirit comes from God the Father via the Logos – via the Son – and then to us. Whereas in Orthodoxy the Spirit proceeds directly from the Father, not through the Logos. If you think of the Logos as reason and rationality you can see where that would lead to a kind of intellectualizing of the experience of the Spirit by thinking that it is mediated by the Logos, whereas for the Orthodox believer (at least this man) the experience of the Holy Spirit was not logical, not rational, because it didn’t come through the Logos. It was immediate to God the Father. That would bear out exactly what I’ve been talking about – this mystical access to God that is not rational. It is arational. This sort of experiential approach seems to have had a great appeal to Hank Hanegraaff. DR. CRAIG: Theosis, or divinization, is the idea that we somehow come to partake of the divine nature. This can sound like pantheism, right? That somehow we become God; that we become divinized. But that is not what the Eastern Orthodox mean by that. They recognize that God has essential properties like necessity, eternity, omnipotence, omniscience, and so forth, and that I never will come to partake of those properties. I will never be omniscient and holy and omnipotent and eternal and necessary. But what they mean is that I come to have this sort of mystical union with God and so partake in the divine nature as well. In that sense, that is unobjectionable. Protestant theologians often talk about our mystical union with Christ – that we are in Christ insofar as we are regenerated by his Holy Spirit and in a state of grace we are in Christ and thus have a kind of mystical union with him. But that is emphasized even more strongly in this Eastern tradition and seems to have spoken deeply to Hanegraaff’s heart. KEVIN HARRIS: As we conclude the podcast today, one thing about Eastern Orthodoxy is that many are drawn to it for another reason and that is they want to try to get back to the first century church – to the New Testament church. They think that Orthodoxy or Roman Catholicism or other things like that are the way to do that. I am going to ask you – don’t we all who belong to the church of Jesus Christ want to be a New Testament church? DR. CRAIG: I think that is absolutely right. People who converted from evangelicalism to Orthodoxy early on like Peter Gillquist would claim that they are getting back to the New Testament church by becoming Orthodox. I think that is a bogus argument. When you read the pages of the New Testament that gives you a picture of what the New Testament church is like. That could be any local congregation in any town that is unrelated to submission to a patriarch or a bishop that would be over these various churches much less that would represent the kind of developed tradition that exists within Orthodoxy. I think we can all aspire to get back to the New Testament church in terms of its primitive beliefs. In fact, I would say that of the churches that I’ve worshiped in the one that would probably have the most plausible claim to be like the New Testament church would be the Brethren. When we were in England, we worshiped at a Plymouth Brethren church. In these churches there was no appointed minister who would preach every Sunday. Instead there were elders. Anyone could stand up during the service and share a song or a Scripture reading or give an exhortation. It sounded very much like the kind of worship service that you have in 1 Corinthians 12 to 14 where various prophets would get up and speak and the others would weigh what is said. That sort of worship service to me probably comes closest to what was going on in the New Testament in these local communities where there were no professional clergy and there were just local Christian groups that would meet together. But we don’t need to try to imitate the style of worship of these early churches. What we need to be sure is that we are on the same page with them doctrinally and in what we believe and in our common mission to fulfill the Great Commission and preach the Gospel to every nation, baptizing them and making disciples in the name of the Lord. http://www.christianitytoday.com/news/2017/april/bible-answer-man-hank-hanegraaff-orthodoxy-cri-watchman-nee.html (accessed July 3, 2017).